A 19th C palace and lighthouse on the north-west side of Mount Carmel, built over levels from earlier periods. 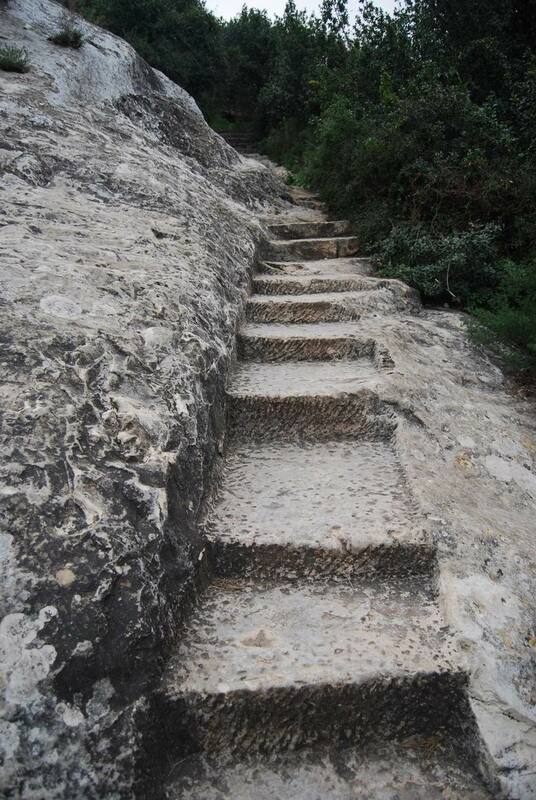 An ancient path leads to Elijah's cave. Joshua 19:26: "...and reacheth to Carmel westward"
Jeremiah 46:18: "...and as Carmel by the sea..."
A 19th C palace and lighthouse on the north-west side of Mount Carmel, built over levels from earlier periods. 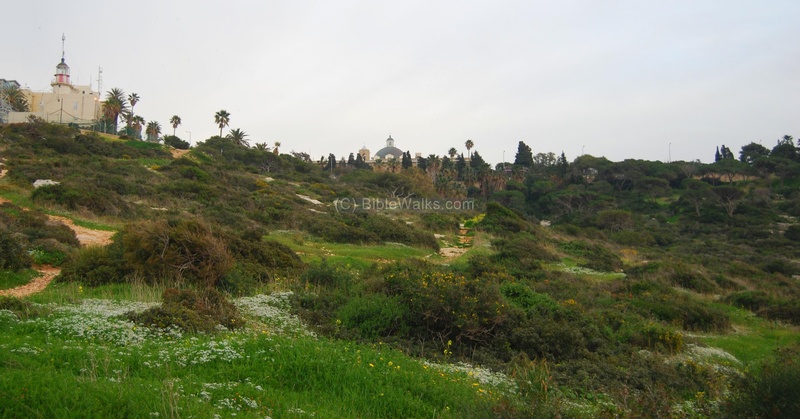 From this site is an ancient path down along the foothills of the Carmel, from the Carmelite Monastery down to Elijah's cave. The Monastery is located on the north-west corner of Mount Carmel, adjacent to the upper station of the Haifa Cable car. The following aerial view shows the location of the Monastery and the area of Stella Maris. You can point on the purple points to navigate to the selected point - in this page and other pages. 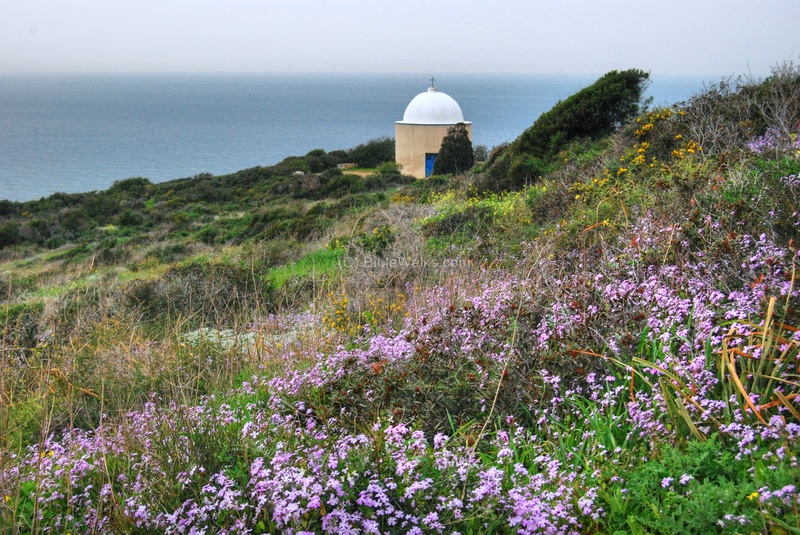 The top of the Carmel, at the area of Stella Maris, was a landmark for sailors approaching the bay of Haifa, since it is seen from a great distance in the Mediterranean sea. It was regarded as a Holy place and referred in several ancient sources. A Roman/Byzantine site existed at this area. A Byzantine church was located at the site of the modern lighthouse, but was destroyed during the Arab conquest, and converted to a mosque. During the 12-13 C the Crusaders built a fortress over the ruins of the Byzantine church. This castle was part of the fortifications of the Crusaders along the pilgrimage route from acre to Jerusalem . It is referred in some Crusaders maps as "Santa Margeretta", named after a woman that was executed in the 3rd C in Antioch in Pisidia. This castle was destroyed after the Crusaders were defeated in 1291, and remained in ruins until the 19th C.
In 1821 Abdullah, the Ottoman governor of Acre, decided to build a summer palace in Stella Maris, over the ruins of the Crusaders fortress. He reused the stones from fortress, as well as the stones from the ruined 17th C Carmelite Monastery. In 1831 the building was handed over to the Carmelites and was used as a Christian hostel. The Carmelites, who rebuilt their monastery (1836), were under the protection of the French Kings, and the term "French Carmel" is still used today as the area around Stella Maris. A light house was added to signal the edge of the Carmel to the ships in the bay of Haifa, giving its name to the area (Stella Maris - the "star of the sea"). In WWI the Turkish Army kept a force at the camps in this area. The British installed in WWII a radar system on the west side of the structure. The British established bases around this area. They also built fortifications along the cliffs, as part of a defense line against the Germen forces that were pushing through North Africa towards Egypt. After the war, in 1946-1947, the radar was a target of the Jewish forces, in order to prevent the detection of the ships bringing Holocaust survivors into the country, such as the famous "Exodus". After 4 attempts, the Palmach forces finally managed to blow up the radar station. The compound, including the light house and the radar station, is a closed military area. In the mid 80s the Haifa cable car was constructed, with the upper station located on the north-east corner of Stella Maris. In July 2006, during the war with Lebanon, the first long-range missile targeting Haifa hit the area below the upper cable station (July 14). The cable car project was hit several times later during the war, and was closed for a year and a half due to extensive repairs. Today the area of Stella Maris and the Carmelite Monastery are a popular visiting place for tourists and pilgrims. It is adjacent to the vista point that overlooks on the bay of Haifa, at the upper station of Haifa cable car. An aerial view captured by a quadcopter drone is shown here, viewing the edge of Mt Carmel from the North West side. The photo was captured at the height of 70m above the ground, close to the cable car lower station area. The entrance to Stella Maris is seen on the photo below, where a tall statue stands between a number of palm trees. This statue, with Mary holding infant Jesus, was donated by Chile. There is a wonderful panoramic view of the city of Haifa from the cable car's upper station, located on the north side of Stella Maris. 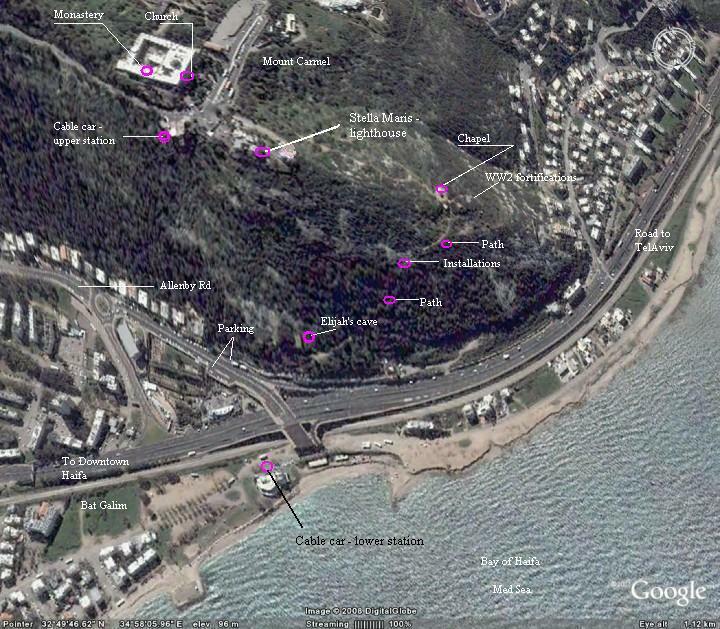 The photo below shows the western coastal side, where the lower cable car station is seen (bottom left side), the Bat-Galim promenade along the coast, and the naval museum (bottom center). The photo below shows an eastern view, with Rambam hospital (on the upper left side) and the port of Haifa (upper center). This is the view from the west (sea) side, along the path that descends to Elijah's cave. The Stella Maris summer palace and lighthouse is seen on the right side, while the Carmelite Monastery is seen in the center background. 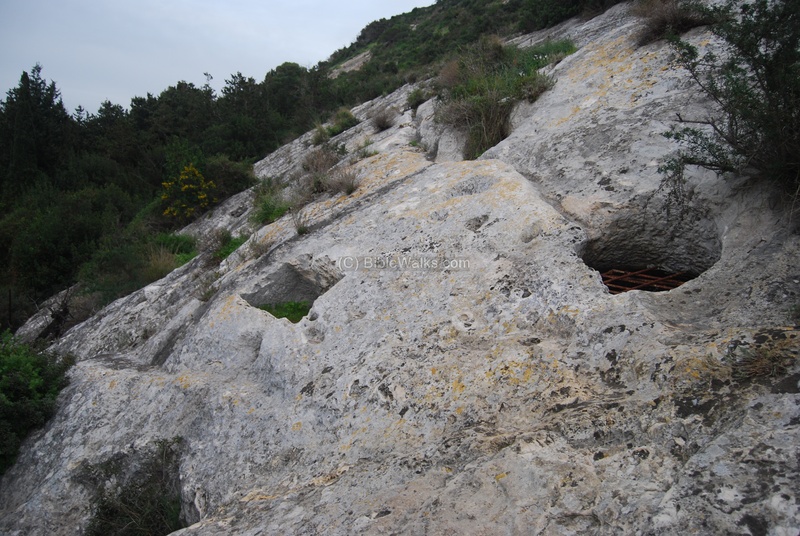 On the left side are traces of the terraces that once were used by the Carmelites to grow agriculture products. About 300M west to the Stella Maris structure is a small chapel, called the "Holy Family" chapel. It is also named after one of the Carmelite early leaders - Simon Stock (13th C). 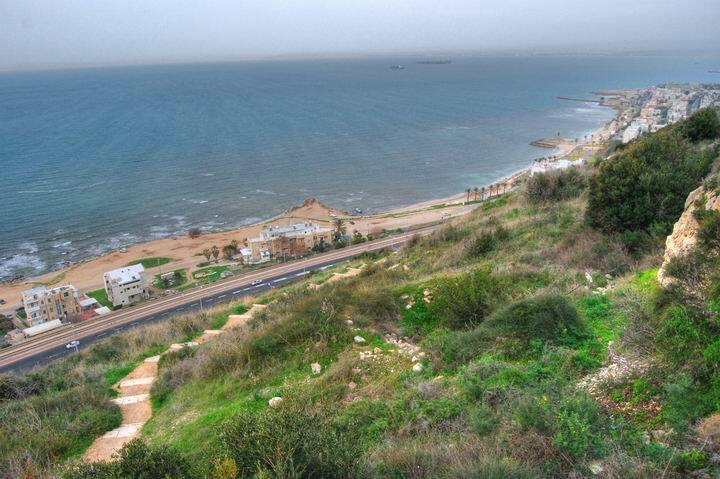 From the balconies around the chapel, on top of the British bunkers, is a beautiful view of the coastline - including Tell Shikmona on the south side and the bay of Haifa on the north side. The pink flowers above are called "Ricotia Brassicaceae". It is interesting is that their Hebrew name is "pretty Carmelite" ("Carmelite Na-ah"). They are named as such since the delicate flowers, which grow among the rocks in most of the Galilee and here near the Carmelite monastery, are cross-shaped and resemble Carmelite crosses. The chapel, seen in a closer view in the photo below, was actually a wind mill that was converted into a chapel in the 60S, as inscribed on its wall. Around the chapel are several bunkers and military posts, that were constructed by the British at WWII, as a defense line against the German invasion from Northern Africa, and as part of the fortifications of the radar in the Stella Maris building. The path continued from the chapel down towards Elijah's cave, on the lower foothills of the Carmel. In the photo below you can see the stairs of the upper section of this path. In the right background, along the shores of the Mediterranean sea, is the promenade of Bat-Galim. Behind it, in the far background, are two ships anchored in the bay of Haifa. In the center of the photo are the ruins of an ancient limekiln, which was used to produce quicklime. In the middle of the path the stairs are cut into the bald bedrock surface, as seen in the photo below. There are holes that were used to prevent skippering , and allow horses, donkeys and camels to climb up the stairs. In the photo below is another section of the path where the steps are cut into the rock. The path goes down to Elijah's cave. The last section crosses a small forest, as seen below. About halfway down the path to Elijah's cave is a huge exposed bedrock on the slopes of the mountain. Curved into the rock are several ancient water installations. In the photo below, on the bottom right side, is a deep water cistern. Two grooves (one is seen behind it, while the other is hidden on the right side) lead the water into the pit. These aqueducts filled up the water during the winter time, and the water was available during the hot summer season. A smaller water reservoir is seen on the bottom left side, and was filled with buckets from the cistern. These installations may have been arranged by the Carmelite hermits in order to create a reservoir of water along the path. Perhaps, they may have been cut in ancient times. A closer look on the water reservoir. The water was fetched from the cistern, poured into the upper wide groove shaped as an arc, which then filled up the reservoir. Along the right side are 7 small holes that helped to climb up the steep rock. On the bottom exterior there is an outlet to clean the tank. 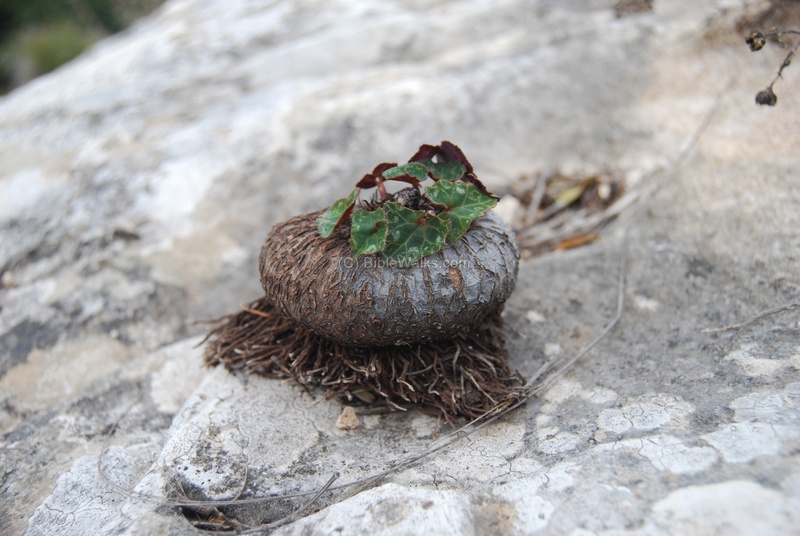 Near the installations above we noticed a lone cyclamen (Rakefet) bulb struggling to keep alive on the surface of the rock. There are many wild flowers blooming in the early spring time along the path. The photo below shows one of these flowers, growing in clusters near the chapel. The flower's common name is Yellow-Asphodel (Asphodeline lutea; "Ironi-Tzahov" in Hebrew; Rotem - Webmaster: thanks to my uncle Ronnie who is our flower expert). Wild flowers of Israel - guide to Israeli wild flowers. Stella Maris - Latin: Star + Sea = star of the sea. This refers to the light-house.